Harold Sechler and Ellen Hagenbuch were first cousins. Harold’s father, John Sechler, was a brother to Ellen’s mother, Hannah (Sechler) Hagenbuch, born 1889. Only a year apart in age Harold and Ellen died within a month of each other; and during their lives they only lived a few miles apart and were both unmarried. Harold was the last Sechler of his generation. Ellen was the last Hagenbuch of her generation. 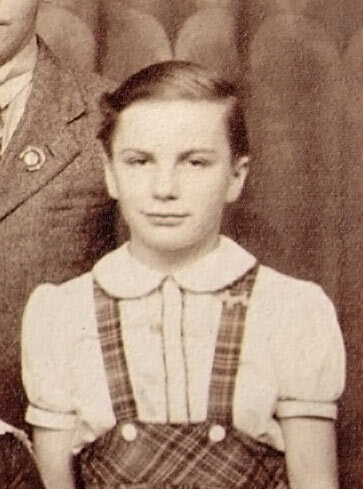 Harold’s father died when he was four years old. His mother, Bessie (Robbins) Sechler was not well, so Harold went to live with his Aunt Grace (Sechler) Cromis, her husband Peter Franklin Cromis, and their children, Myron and Mary. 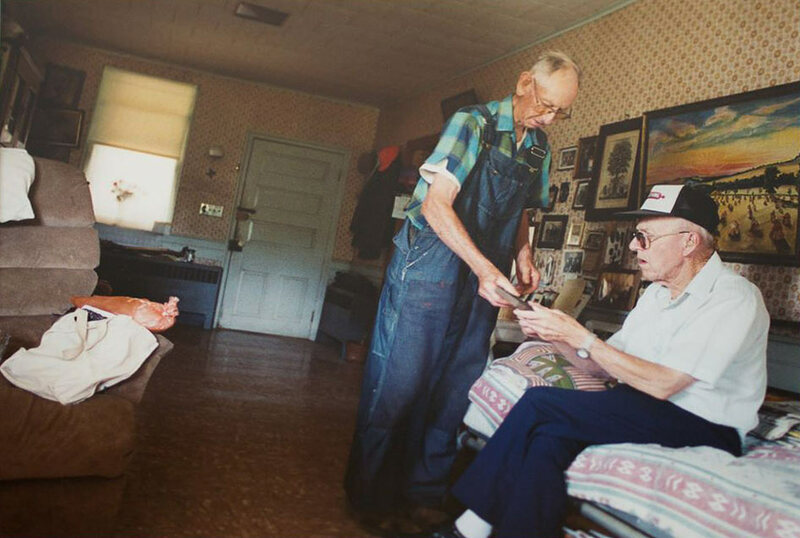 After the death of P. Franklin Cromis in 1938, the family farm was run by Myron and Harold. Neither one married. As first cousins, they will always be remembered as a team. Myron and Harold farmed and were well known in the area for their butchering prowess. In the 1970s they began raising Belgian horses and they even did some farming with them—just to show others how plowing, sowing, and reaping were done the old way. Myron and Harold were very close to their Hagenbuch first cousins. Homer Hagenbuch (b. 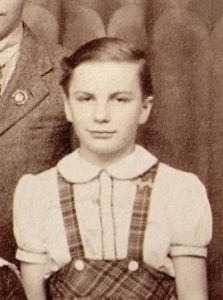 1916) was a regular visitor, especially as he got older. 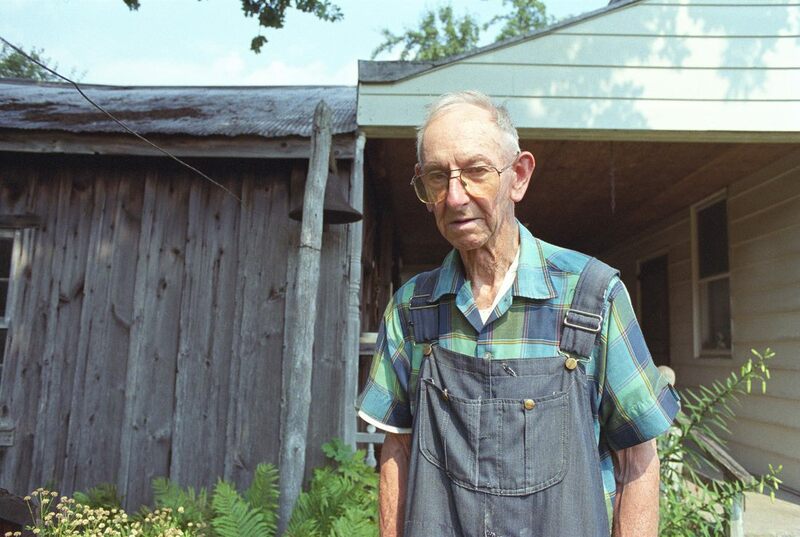 By the time Myron died in 1987, Harold was beginning to slow down but still did some farming and carpentry, as well as canning and smoking foods. He was wise in the old ways and old times. Homer would often go to visit, and they would talk over bygone days looking at old photos of the family. I met Harold Sechler the summer of 2006 when I was 19 years old. That summer was the first I’d spend near Milton, Pennsylvania, photographing everything I saw, struck by the old farming culture my grandparents and their cousin Harold had access to. Harold was unlike anyone I’d ever met. He’d spent his life caring for animals on a square patch of land, creating beautiful works of carpentry and tending to the farm. 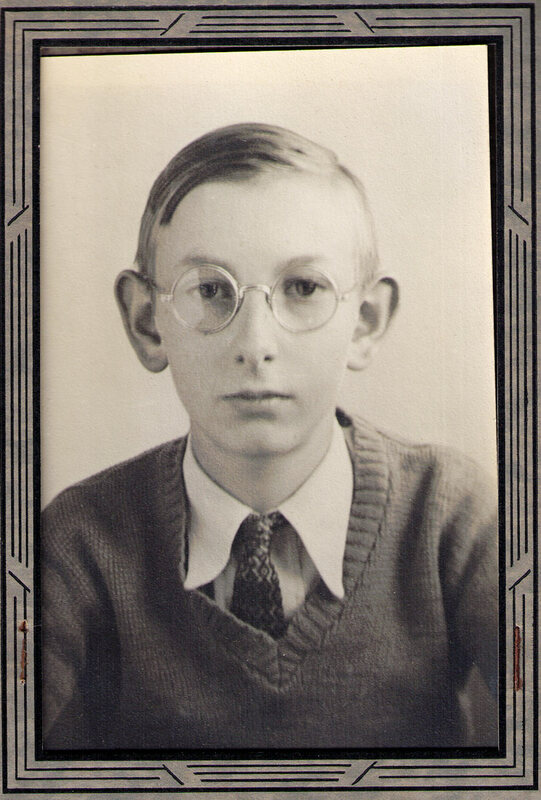 I was a young photographer and Harold was a striking subject, at about six foot four, in his baggy patched overalls, wide ears and soft eyes. He became my muse. When I went back to college that fall of 2006, I wrote a letter to Harold and was thrilled to get a response just a few weeks later. He’d placed a Kilroy sticker on the back, something that would become a pattern throughout my remaining years in college. He made jokes about my life in New York City and wrote stories about his dog. I’d send him black and white postcards printed in the dark room. One of them—a mirror selfie taken with an old Canon—he framed and displayed in his home. When I moved to Mexico City in 2012, Harold mailed me a letter that arrived hand-delivered to my Narvarte apartment. Harold was an inspiration of what it looks like to dedicate your life to one place, tending to what’s in front of you and sharing your small joys. Harold F. Sechler, 94, of Danville, passed away Wednesday, January 31, 2018 at Grandview Health Home, Danville. Born in Milton, on December 19, 1923, he was the son of the late John McWilliams Sechler and Bessie May Robbins. Harold was a member of Washingtonville Lutheran Church. He also volunteered for the Montour DeLong Fair Association. He farmed most of his life at the family farm. Harold enjoyed working with his horses on the farm. Harold is survived by his cousins. Besides his parents, he was preceded in death by his three brothers, W. Howard, Andrew L,. and Robert C. Sechler, and sister, Eleanor M. Rhoades. Family and friends are invited to call from 1 PM to 2 PM Friday, February 9, at Brooks Funeral Home, 207 Broadway St., Turbotville where a funeral service will be held at 2 PM with his pastor the Rev. Melody Sell, Washingtonville Lutheran Church, officiating and the Rev. Nancy Warner, Paynes Chapel United Methodist Church, Sweet Water, Alabama, co-officiating. Burial will follow in Washingtonville Lutheran Cemetery. Ellen Lucille Hagenbuch lived most of her life in and around Limestoneville, PA. Although never married, she had many nieces and nephews. So, she was known by many as “Aunt Ellen.” Her love of flowers, love for her family, and the care she gave to thousands of babies at the hospital nursery in Lewisburg will not be forgotten. In fact, she was the first “babysitter” for several of her grand nephews and grand nieces that were born at that hospital. Homer and Irene went to live at Elmcroft and it will be quite an adjustment. Had kraut for dinner; should be very prosperous year. She planned to see White Christmas, but it was too foggy. A specialist from Williamsport who saw (the twins) several months ago praised the hospital for the care given them; so I guess we accomplished something that we can be a “wee” bit proudful of. Besides her family, working in the nursery and taking care of the newborns was her life for those 36 years. She also volunteered at the hospital for many years after she retired. We’ve had many discussions over the years about when or where or how something took place and sure enough, Aunt Ellen would check her diary and we would have the answer within a short time. When I was preparing her house to sell at public auction, I was reminded how frugal she was. I discovered she saved the wax paper bags from cereal boxes, and I would find them stashed in not one cupboard but many cupboards and drawers. It became amusing as to how many. I wished I would have kept an account. She also enjoyed photography. In the 1950’s and early 60’s she would take slides of her vacation out West and, of course, photos of her siblings and their children. I remember having several slideshows at Grandma and Pappy’s when I was younger. Aunt Ellen had a projector that is probably sixty plus years old. The screen was thrown away around the time of her sale in 2010. I’m not sure if the projector stills works or not. She continued to take pictures (not slides) and has many scrapbooks filled with pictures of weddings, picnics, church events, nieces and nephews, and their children and grandchildren. Aunt Ellen was a person for saying “Thank you.” She was taught well. Up until the week before she died, she almost always told Butch and me, “Thank you for coming.” That meant a lot to me. The last three visits I had with her, that didn’t happen and I knew it was just a matter of time that she would meet her Lord. 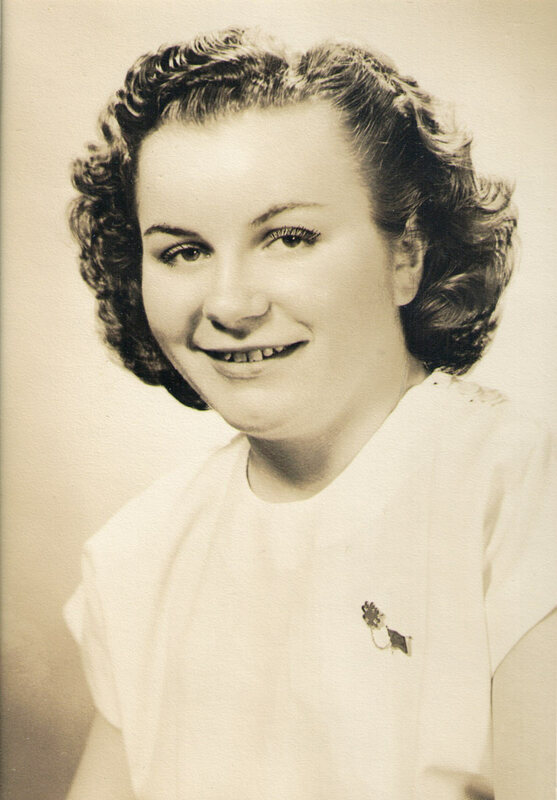 Ellen L. Hagenbuch passed away on February 27, 2018. Burial will be at Washingtonville Lutheran Church, Washingtonville, PA. Born December 5, 1926 in Turbot Township, Northumberland County to the late Clarence C. and Hannah M. (Sechler) Hagenbuch. She lived in Limestoneville until moving to Milton in 2010 and has been a resident of Milton Nursing and Rehab since 2012. 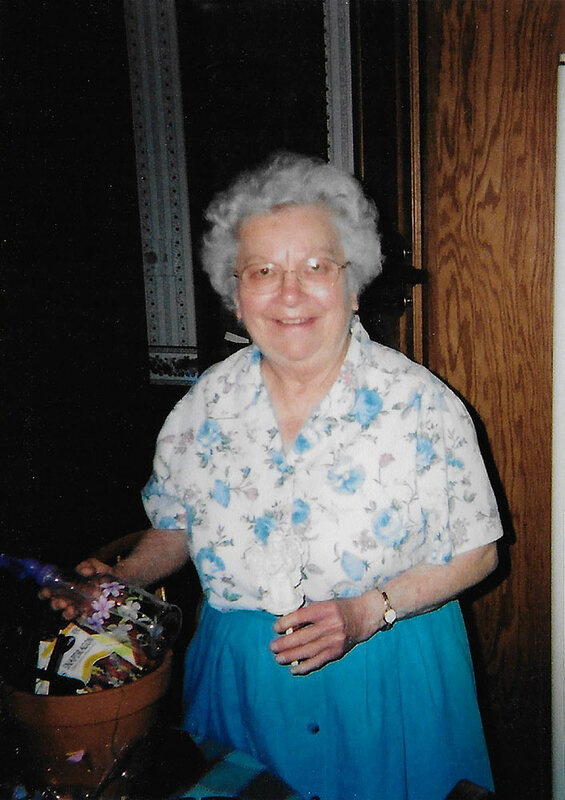 Ellen was a lifelong and currently the oldest member of Trinity Lutheran Oak Grove Church, Liberty Township where she was baptized January 27, 1928. She was active in the Women of the ELCA and helping with the annual church festival. She graduated with the Class of 1944 from Milton High School. She rarely missed her class reunions. She was employed at Evangelical Community Hospital for 36 years. Most of those years in the Nursery as an LPN. When she retired in 1991 she was informed that 32,391 babies were born at Evangelical since she started in 1955. Ellen enjoyed flower gardening and floral arranging, baking Angel food cakes and sharing with many friends, neighbors and family. She also enjoyed hosting her family for Christmas gatherings. She learned to sew in 4-H Club and entered her blue wool coat at the PA Farm Show and took second place in the State. She spent many hours sewing for herself and family at her nine-foot sewing center made by her brother, Wilmer. She was the last of her immediate family. Besides her parents, she was preceded in death by five brothers, Charles, Homer, Wilmer, Lawrence and Lee, Hagenbuch Sr. and two sisters, Florence Robb and Mary Taylor. She was also preceded in death by niece June Marie Robb Fry and nephews Lee, Jr, Larry and Dan Hagenbuch. She is survived by her nieces and nephews, Gary Hagenbuch and Gail Davis of Massachusetts, Barbara Huffman of Dauphin, Robert Hagenbuch of Missouri, David Hagenbuch of Florida, Mark Hagenbuch of Dillsburg, Nancy Worden of New Jersey, Lynn Hagenbuch of Florida, Alice Helder of Mt. Joy, Leon Hagenbuch of Watsontown, Joseph Robb of Langhorne, Kathleen Shuler, Limestoneville, Carol Dunbar of New Hampshire, Sue Hertzler, Milton and Nevin Taylor, York and many great and great great nieces and nephews. As one of her nephew’s stated at Aunt Ellen’s funeral last week, “We are now the older generation.” So, it is our responsibility to remember those who were the previous generations. It’s our responsibility to save memorabilia that other generations thought it important to save. And, it’s our responsibility to pass on memories to the generations who come after us, teaching those that come next our rich family histories. This is a truly awesome article . Written about 2 dear people I knew pretty well . This made me cry . 9 yrs old . Aunt Ellen and Aunt Mary took me many places (dances , roller skating , etc.) before I was 16 and had a drivers license . They will be genuinely missed . This is beautifully written . Thank you Mark and Kathleen . Also Julie ! Beautiful tributes to 2 wonderful people. What a wonderful story to stumble upon. My mother was a Cromis, Myron a Great Uncle to me, I went to spend a couple of weeks one summer with Harold and Uncle Myron on the farm. Powerful wonderful memories.